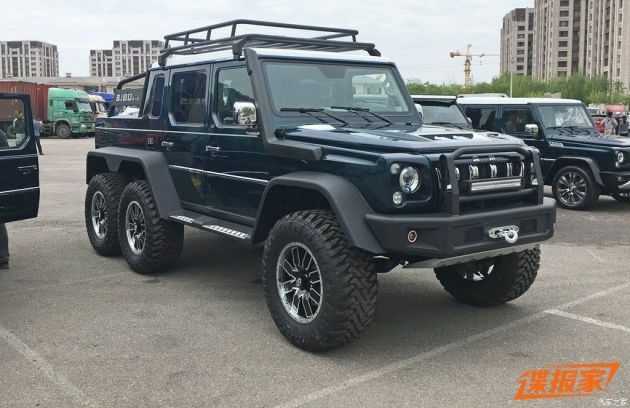 BAIC BJ80 6x6 seen for the first time - G63 copycat? Home » Cars » BAIC BJ80 6×6 seen for the first time – G63 copycat? BAIC BJ80 6×6 seen for the first time – G63 copycat? With the 2018 Beijing Motor Show scheduled to kick off tomorrow, it looks like Beijing Auto International Corporation (BAIC) is set to unveil a 6×6 tri-axle version of its BJ80 pick-up truck. Unsurprisingly, several design cues appear to be “inspired” by the legendary G 63 AMG 6×6. The huge vehicle was spotted as it arrived at the exhibition hall for the motor show, featuring a black snorkel running up the right A-pillar, small rounded headlights with projector units, LED light bar just under the front grille and an integrated tow hook within the front bumper. There’s also a skid plate under the front bumper. These pictures courtesy of Autohome and PCauto also show additional air vents on the bonnet and front fenders. The side mirror caps are finished in chrome, and the side-view cameras hint at a 360-degree surround-view system. Other visually prominent features include the roof rack, huge spare wheel, LED combination tail lights, quad exhaust exits and an “fuel cap” with a battery logo. While the exterior screams Mercedes-Benz, things aren’t as glaringly similar on the inside. From the photos, it’s clear that the driver will get a four-spoke leather steering wheel with perforation as well as a large instrument cluster (presumably wholly digital). The centre dash also gets a unique, tall infotainment system. Below that, things start to get a tad bit familiar. The button and dial controls for the air-conditioning and infotainment systems resemble that of the Mercedes, and the leather seats with partial diamond quilting is also reminiscent of the G-Wagen. On the far right of the dashboard, a PHEV badge can be seen – unsurprising, because BAIC is an avid proponent of green technology. Performance-wise, it’s unclear what combination of powertrain this plug-in hybrid will get, but word is a Saab 2.3 litre turbocharged four-cylinder petrol could be a likely candidate. According to CarNewsChina, the engine could produce 250 hp and 350 Nm of torque, and the PHEV portion will utilise in-wheel motors (seen in the last axle) from China-based Protean Electric. In terms of outright size, the BJ80 6×6 is probably smaller than the G 63 AMG 6×6, but we’ll have to wait till its official debut to be sure. Also, this may turn out to be a one-off prototype (note its size compared to the standard BJ80 in the topmost picture), and it’s unclear if BAIC will in fact make a production version of it. What do you think of this? Let us know your thoughts below. Also, watch the walk-around video below to check out the RM3.2 million Brabus G700 6×6 in Malaysia. If I say we are the KING when come to copying(rebadge vehicles), I wonder how many will agree ?! Proton made a better Lancer than mitsu. LOL. Ori beats clone !! Are you really 12 years old? Look up old PT posts about the Inspira and you will learn that even Mitsubishi admitted the suspension tunings done by Proton made the Inspira even better to drive than the Lancer. Proton’s handiwork is said to have impressed Mitsubishi’s test drivers as well, the very same ones that sign off cars like the Lancer Evo. 2009, kek, Geely haven’t bought Volvo yet. Today, Geely is more innovative and progressive than any other Chinese car makers. Haters really desperate to try pull down Geely, even bring up ancient news no longer applicable. PT, did you know BAIC is helding 51% JV with Mercedes in China ? I doubt they did, if you count BAIC copycat G63 then shall we say Proton copycat Lancer and Perodua copycat Daihatsu?